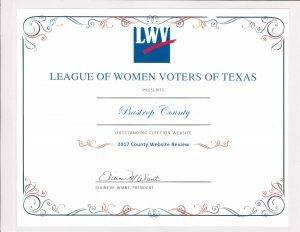 elections for other governmental entities that may contract with the county for election services. We hope that you find our website helpful, informative, and easy to navigate. This website is full of information necessary to exercise your right to vote. You should easily be able to find information on how to register to vote, where to vote, and when to vote. We are excited to announce that we are expanding our social media. Follow our Facebook and Twitter sites, and feel free to share links from our site directly to your social media site. Want the most up to date Voter Registration and Election information? If you need additional information, don’t hesitate to contact our office. ¿Necesita información o ayuda en español? Por favor comuníquese con nuestra oficina al 512-581-7160. 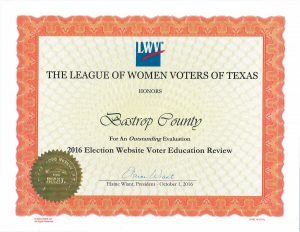 The Bastrop County Elections Department has received an award for an outstanding website 2 years in a row from the League of Women Voters of Texas!